Experiencing a unique phenomenon nothing like the humdrum of daily life is often the sole intent of travellers crossing the globe looking for an adventure – and viewing the Northern Lights in person is arguably the most exceptional experience you can have. Each appearance of the Northern Lights is unique – you may see multiple green bands marking the night sky, or something resembling green rolling smoke with a hint of pink, or a deep purple centre. At times they simply explode across the sky for a minute, leaving you wondering if it was real or just an illusion. Caused by the sun lying behind the formation of the auroras; the energy released during large solar explosions interacts with the atmosphere around the magnetic North and South Poles and causes the phenomenon approximately 100 kilometres above our heads. The lights occur all year round, but visibility is weather dependent and in parts of the world they can only be seen during certain months; in Greenland they are blocked out during summer by the midnight sun. 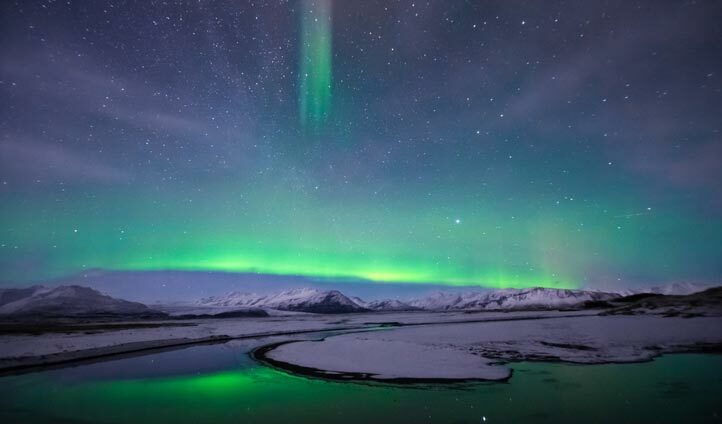 Other places you can see the mysterious Aurora Borealis include Alaska, Denmark, Scotland, Canada, Finland, Iceland, Norway, Russia and Sweden, or for the Aurora Australis, head to Southern New Zealand, Tasmania or Antarctica. Scientists are predicting that the Northern Lights are about to start appearing less frequently, with them also appearing less vibrant when they do show than in the past few years. This is because the lights are a result of solar activity, which goes through 11-year cycles – divided by times when solar activity is active and when it’s dormant. Solar activity was at it’s peak in 2014, and we’re now about to gradually enter the dormant phase of the solar cycle in 2017, which means fewer nights lit up by the Northern (and Southern) lights. This means that the Aurora Borealis will be at their most vibrant now and in early 2017, as the earth moves into a new alignment with the sun’s most active areas, and the lights aren’t expected to be at this strength for several years. So, make 2017 the year you spot the Northern Lights for yourself.